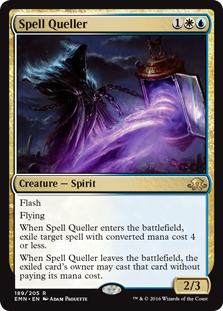 Spell Queller is performing exactly AT expectation… If you expected it to completely redefine the format. When was the last time a new card hit Standard and made such a dramatic impact, across so many archetypes? Spell Queller is “only” a rare but is already outperforming most playable mythic rares in terms of secondary market value. Oh yeah, it is also both headlining and making multiple archetypes; and forcing opposing decks to re-think their basic assets. Spell Queller is a great offensive drop, generally surrounded by other great offensive creatures. This is the big one. Players are cutting their Jaces for Selfless Spirit in order to promote flying, attacking-oriented themes. That means that even though you can potentially get your card back, Spell Queller decks are designed to put you on the back foot. You might not have the time to recover. Duskwatch Recruiter was already a good card, generally played as a three-of (if not four-of) in Bant Company decks. Mike speculates that Duskwatch Recruiter will get even better in the coming weeks and months. Can you imagine how hot that three open mana will be after dropping a turn two Duskwatch Recruiter? You can leave it up to Spell Queller the opponent (if he casts a spell); and just draw an extra card (probably a Spell Queller, let’s be honest) if he doesn’t. Spell Queller and… Noose Constrictor? One of the most interesting moves of the weekend was the adoption by Andrew Boswell of Noose Constrictor in G/W Tokens. Is Noose Constrictor awesome? But it does have reach. Noose Constrictor is a key role player that G/W now needs just to block Spirits; Spirits, you know, like S—- Q——. Either Way… Splash Bloodhall Priest!